Temple Grandin is not the story of a brave, courageous woman who fought the odds (and misogynistic men) to fulfill her life’s dreams. Rather, it’s the tale of a woman who does what she needs to do, and however she can manage. Growing up, Temple (Claire Danes) was not like other children. She did not speak until she was four and had a strong aversion to other people. More painful, especially to her mother (Julia Ormond), was a revulsion to being touched by another person. No hugs, no comforting, no squeezing. The movie starts the summer before Temple begins college. She goes to live on a ranch in Arizona with her aunt (Catherine O’Hara), and her lifelong love of cattle is given a chance to blossom. But it’s not just cattle that she loves; her mind works in an extraordinary way, giving her the ability to see the solution to mechanical problems. But by having a mind that can instantly recall everything it sees, and an almost superhero-like ability to solve visual problems, Temple does not function as well in other areas. This is Temple’s autism: a hyper-sensitive existence, where the sound of a fish bowl pump is excruciatingly overwhelming. Heat, too, she can sense, as evidenced when she gets off of the plane in Arizona. The first section of the film portrays this visually, as Temple might understand it; the air-traffic control tower bursts into flames. 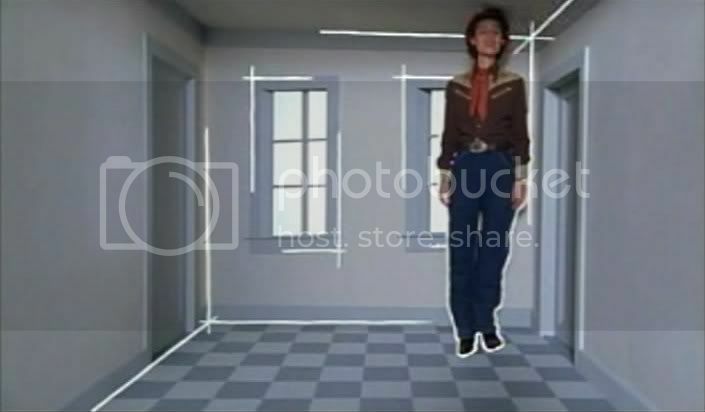 The technique is used less frequently as the movie continues, becoming a useful visual guide without being overly stylish. Temple’s social skills are also lacking. She has learned to greet people and shake their hands, but immediately after the necessary introduction she blurts out whatever she’s thinking. Crowds of people create a strong sense of anxiety, as do certain noises. After witnessing a cow-holding device in action she discovers that a gentle application of force all around her is remarkably calming. When she creates such a machine for herself at college, however, the Freudian psychologist declares it inappropriately perverse and has it destroyed. She has a unique gift for creating elaborate and practical machines, and once she manages to provide scientific evidence of the squeeze-machine’s efficacy she is allowed to keep it. Applying her engineering ability to her love of animals, she manages to work toward a Masters degree in animal husbandry. The rough cowboys on the ranch needle her, no less because of her frequent, socially inappropriate vocal outbursts. Expecting her to be disgusted by cow viscera they splatter her truck with bull testicles. But she is not afraid or disgusted by this; when an animal dies it is simply “gone,” as it is no longer breathing. It is almost as though she cannot see it any longer. Eventually her connection to mooing animals, particularly cows, and her penchant for solving visual problems leads her to create a humane method for caring for cows, and even for slaughtering them. Her reasoning is that living on a ranch and being killed with a captive bolt pistol is better than being torn into pieces by a lion. And, if humans are eating the meat and have the opportunity, why not treat the animals with kindness? Her ability to show cost savings and a return on investment are the stronger reasons ranchers gravitate toward her designs. An end title informs the audience that half of the cattle in North America are handled in systems she has designed. Her story is remarkable, both as she struggles to do what she loves while having a condition that makes her “different, not less,” and as she attempts to reform, with her natural stubbornness and passion, an often cruel and unnecessary manner of handling livestock. 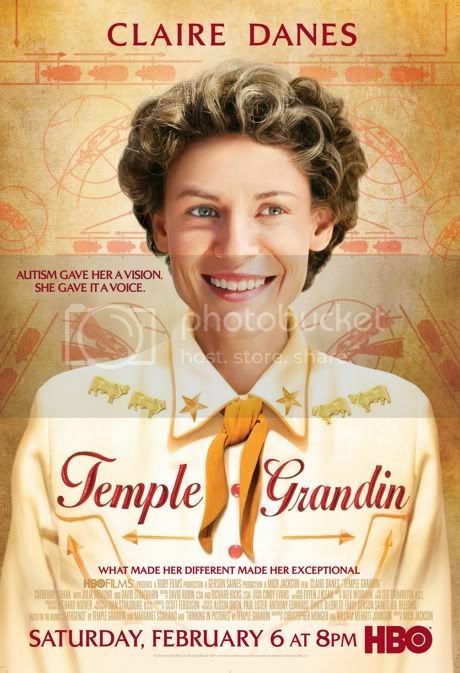 Temple Grandin provides an interesting and engaging look at how she has given autism, in all its manifestations, some much needed exposure. The production is slightly over-dramatic at times, but powerful acting (primarily by a courageous Danes, but also by a subtle and emotional Ormond, whose pain at having an emotionally withdrawn and unreachable child is evident in her face) and an amazing story make the film an enjoyable and educational experience. This entry was posted in 2 pirate flags, 3 stars, Movie Reviews, Pirate Flag Rating, Star Rating, T on March 31, 2010 by Tim Irwin.